The weekend of Frieze is over now; but the legacy of what is arguably the contemporary art event of the year continues with my Frieze video recap. Unlike most of the UK’s art exhibitions, this one is going to cost you. 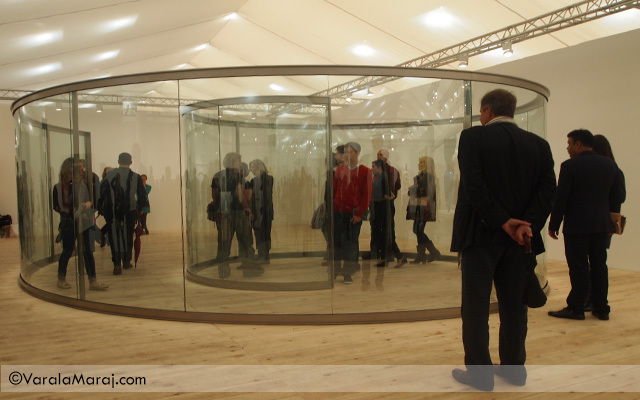 One day at Frieze London will set you back £32 (or £23 if you’re a student). But is it really worth it? After visiting Frieze Art Fair last weekend (and having my Frieze-related tweets immortalised on Seen.co) , not only are there a lot of weird things that pass as ‘art’, but there are also tons of quirky concepts and modern installations that make this a must for anyone into art. These 11 reasons why. Conveniently located next to the on-site children’s playground is the artist’s playground known as Frieze Projects. 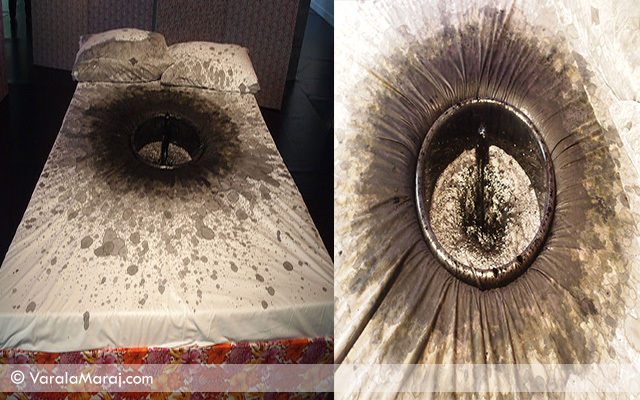 With ink splashing up like a fountain in the middle of a bed, not only do the sheets get dirty but you wonder, why? We’re not entirely sure what was the concept behind Lili Reynaud-Dewar’s installation but the French artist certainly stimulates some dirty pillow talk. Next to the inky bed is rubbish, literally. 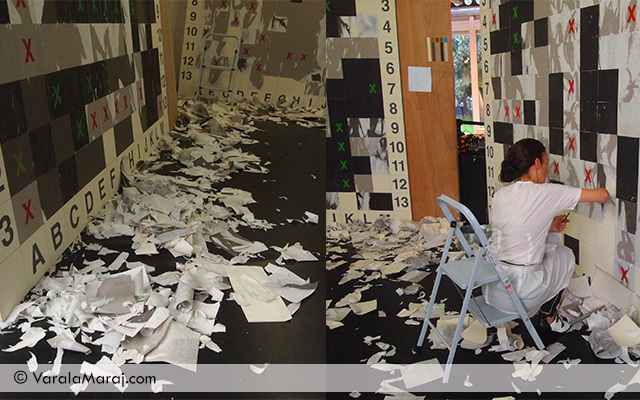 Heaps and heaps of rubbish gather at the foot of huge boards that make an on-going game of Battleship come alive. Brazilian artist Rivane Neuenschwander has the Frieze staff busy, stripping off layers upon layers of paper until the game is complete. But this game would have been even better if patrons were allowed to have a go themselves. Luckily just around the corner is a participatory installation that we can actually take part in. 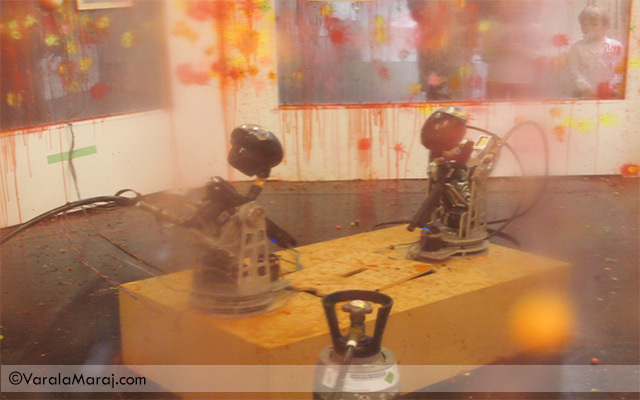 Behind all the paint splats that cover a plexiglass window is Ken Okiishi’s robotic paintball gun exhibit. You are welcome to press the blinking button in the middle- and you’re going to want to. It sets off a countdown for the gun to fire! Although, from the looks of the paint splats everywhere and the occasional shrieks – from kids and adults alike- there is no telling where the gun will target next. Cardboard… cardboard can’t be art, right? You might think so until you see Tobias Putrih’s work. 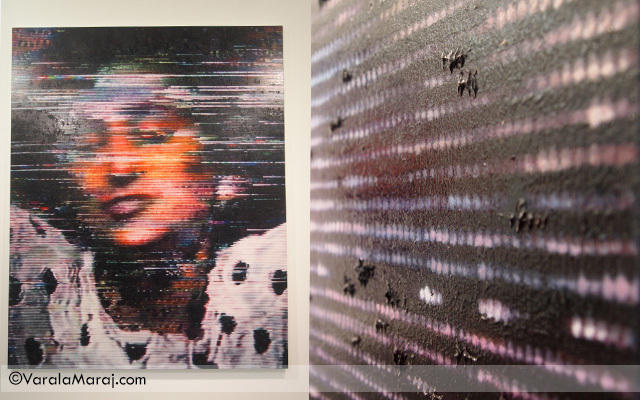 The New-York based artist has been causing a stir with his Macula series since its debut in 2007. 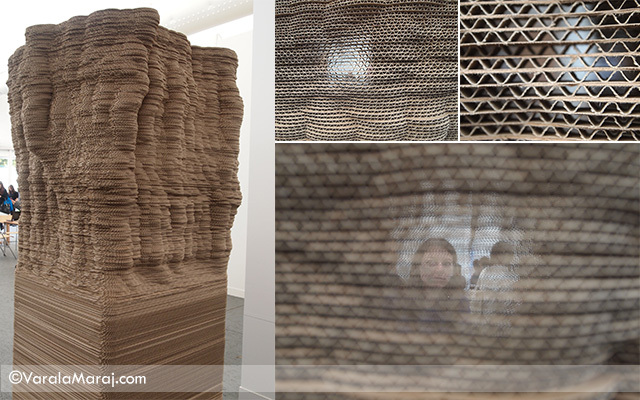 With stacks of cardboard glued together and sculpted into complex designs, you almost don’t believe it. It looks like an intricately carved sculpture of a huge rocky landform. No material is off limits – not even live animals. 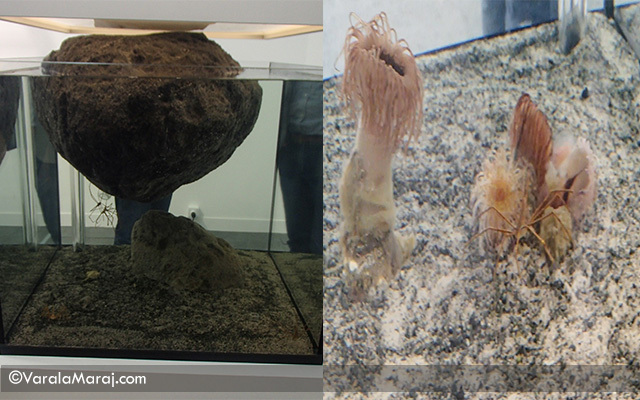 Horseshoe and arrow crabs have patrons ooh’ing and aah’ing as they move across the sand-filled bottom of Pierre Huyghe’s aquariums. They creep up on you, almost camouflaging into the sand. Still, that’s not the most eerie thing in this tank. With a few lanky-legged spiders climbing around the volcanic rocks partially submerged into the aquariums, it’s sure to bring out your inner Ron Weasley. If there’s one thing you won’t find here, it’s a plain portrait. Kon Trubkovich’s ‘Crazy Me. Crazy You.’ is a testament to this. Using VHS tapes as his inspiration, the Russian born artist conveys static spots and blurred lines across a woman’s face. From a distance, you aren’t quite sure what accomplishes this effect, but the recipe is simple: oil on linen. A crowd gathers, gawking at something, exclaiming things like: “Oh my God, that is so freaky!”, “Wow!”, and my personal favourite: “That’s just… creepy!”. 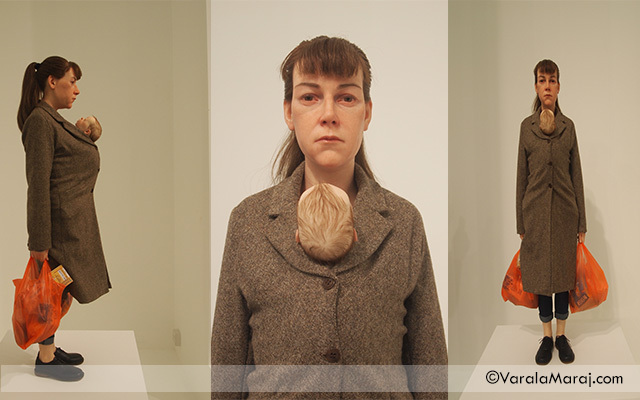 Their eyes are glued to Ron Mueck’s sculpture of a petite middle-aged lady standing with her baby tucked into her coat while she carries her shopping. It is the most lifelike sculpture I have ever seen. Every last detail, down to the pores on her skin and the hair on her baby’s head- all freakishly real. Aneta Grzeszykowska’s women will shock you in a different way. Her photographic series reveals blown ups shots that deliver something compelling using one simple idea: the negatives of black and white photos. 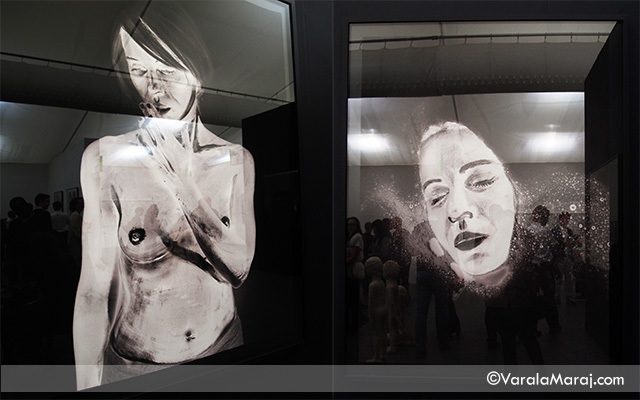 Using inkjet prints of the photos on cotton paper, the Polish artist tells a dramatic story with scenes of a woman’s life; smoking a cigarette, bathing in the sea, in the car with her daughter and up close and personal. It brings intimacy in an unlikely way. 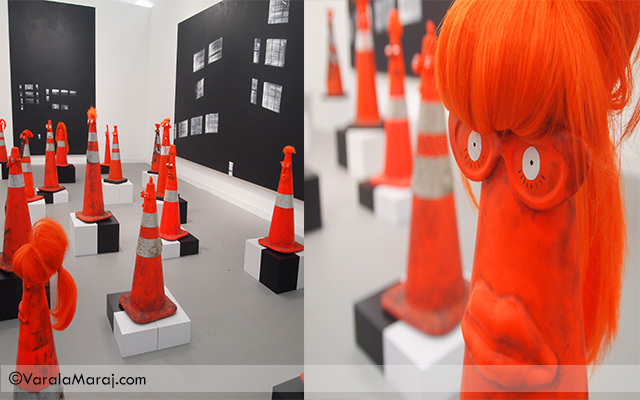 Orange marks the spot with Rob Pruitt’s collection of dirty, beaten up traffic cones assembled onto stands. The cones look like they’ve been dragged right out from the streets and gained personalities in the process. They are embellished with eyes, hair, moustaches, lips, glasses and hats. Each is different from the other. You can’t miss these; their fluorescent colour screams at you from a distance. A bright, open installation space is converted to look like inside a children’s clothing shop. 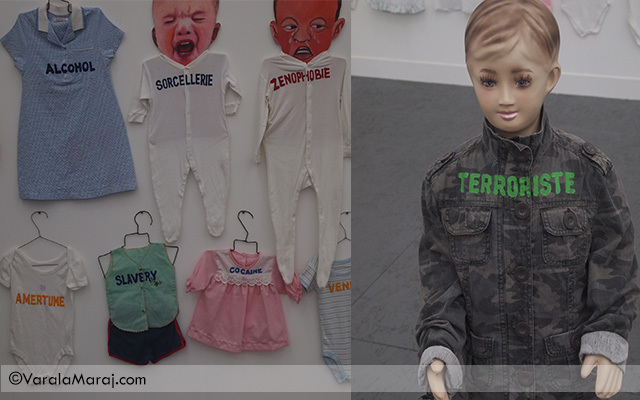 But unlike the typical ‘Daddy’s little girl’ and ‘My mummy loves me’ type of labels, these kids opt for ‘Violence’, ‘Illness’, ‘Zenophobie’, ‘Alcohol’, and ‘Cocaine’ embroidered onto their onesies. Cute. Artist Meschac Gaba, who currently lives and works between Cotonou and Rotterdam, shocks you with this display. And there’s so many of them- it’s unnerving. Dan Graham’s spiral glass structure pulls people like magnets. You see all the curious faces walk into its entrance, swirl around and then come back right where they started. It doesn’t sound that exciting but you end up in there anyway. And when you do, there’s an unsettling feeling waiting for you at the end. Perhaps it’s because you never get to make a full circle. Perhaps it’s because you feel a bit silly. Or it might just be because the glass reflects in way that makes you a bit dizzy at the end. Frieze Art Fair might not always be the most popular show among young people, but if you’re a sucker for mixed media concepts, unusual installations and strangely dressed people, this is heaven on earth. There’s a reason why people from all over the world fly in to see this: there’s nothing quite like it. But bear in mind, you’re going to need comfortable shoes. With over 1000 names in present-day art, that’s over 150 stalls and a staggering total of 971 artworks! You’re sure to see a few – or a few hundred things you fancy.